Another night with Sanjay Cooper at the helm of AC360 and another night of classics from the ATA Archives for my post. BTW congrats to Sanjay and the 360 team for great ratings on Tuesday night. Gupta beat every single CNN program in the demo. Cooper better watch his back, isn't this what happened to Aaron Brown when he took a vaca and someone sat in for him? 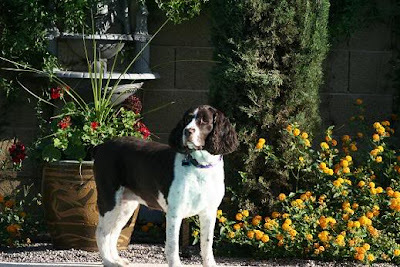 ;) I'm going with an all dog theme tonight in honor of my Springer Spaniel, Bailey, who was put to sleep yesterday morning. She was just the best dog and lived a long, wonderful life. It's been a rough few days for our family but life does go on. Anderson had his dog on 360 back in the good old days of red 360. Here's Molly being 'read' by a pet psychic. This is one of my favorite clips of AC and dogs. It was right after Katrina and he was trying to do a serious live shot with Paula Zahn. Also post Katrina Cooper did a 'Dispatch' about the problem of abandoned pets. There have been more than a few 'The Shots' about dogs. Here are a couple of my favorites, not really because of content but more because of giggles. And here is a clip from August of 2007 with Anderson and one of Michael Vick's dogs. 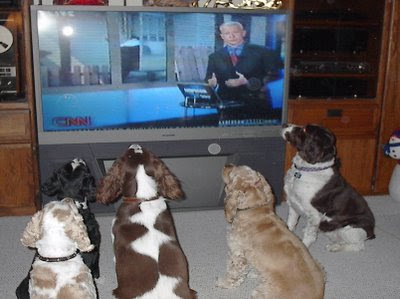 And I'll close my post with the picture, taken a few years ago, of my dogs 'watching' AC on television. Actually 2 of the dogs are my son's and 2 my daughter's and I had 2 dogs at the time also but only one agreed to be photographed. What you can't see is my crazy kids dangling a turkey carcase from a fishing pole over the television so the puppies would cooperate. Yes, you are right Phebe. AC better watch his back. 360 may not be "going to the dogs," but to Sanjay Gupta. I have to say, I have stayed with him the entire week and obviously I'm not alone from the looks of those ratings! Though I've missed AC and I wouldn't mind it a bit if Sanjay really co-anchored alongside AC every nite....and NOT just for reading the bulletins. Sanjay once again, has proven to be very adept and let's remember he does do his own show on the weekends. Tonight he spoke to Sean Penn who is still in Haiti. It seems the Red Cross, whom I gave a large donation, is holding back funds for future needs. In a way I can understand this because at the beginning, large sums were pouring in and now donations have slowed. Sanjay also spoke to a couple who adopted a Russian child who is having behavorial problems. They are trying to sue the Russian adoption agency for not releasing all of the documentation pertaining to "fetal alchohol syndrome." As an aside, my cousin's wife had to put her 12 year old white lab to sleep and I just e-mailed my condolences. So in the end, we are all here, "on borrowed time." Had to laugh at the last photo of all your family dogs gathered around the set "looking" sooo enchanted with AC! Turkey anyone? Thank you for ur "Tribute to the Dogs". They are so cute :) !!! So sorry for your loss, Phebe :( The pic of all the dogs looking at the TV is too cute! Alot of times when Anderson isn't on I usually don't watch, but I've been watching this week as I like Sanjay. He's been doing an excellent job too. I am really enjoying him anchoring and 360 this week has been some of the better ones I've seen in a while. Next time Anderson is off I hope Sanjay fills in for him. So sorry to read about your dog. I recall the trauma for my girls when we had to put our cat to sleep. Losing a pet is really the loss of a family member. My heart goes out to you and your family. So far I watched 360 only on Monday this week; from the ratings looks like I missed good shows! Being a bit boastful, but months before Sanjay's 360 anchoring debut, I emailed CNN and recommended him when AC is out. Dr. Gupta has an upbeat, intelligent delivery--pleasant and easy to listen to and watch, handsome with lots of energy, and I have all positive feelings at show's end. Also, am guessing his contributions to production focus on pleasing and engaging viewers and not the other way 'round. It may not be fair to place blame on Cooper when we don't know, but at times it seems like he does things to inform fans they cannot tell him what to do, or because he wants to do it and will whether we like it or not. Also, AC should work on not scowling at viewers, and turning his beautiful profile to us while looking down and away from the camera at commercial breaks. The reason I tune in to 360is to watch Anderson; he's one-of-a-kind and occasionally we see his greatness, but he needs to consider audience criticism when it's beneficial. So sorry to hear about Bailey, you can tell from the photo that she was a really sweet dog. I loved all the doggie clips; I had never seen the Paula Zahn clip before and I imagine right after Anderson got off camera he played with the dog and fed it something. The last photo of all the dogs watching Anderson on TV was really cute. Phebe, you said you had two dogs at the time, does that mean Bailey was your only dog at the time of her passing? I hope it's not too soon to suggest but maybe you should go to the pound/Humane Society and adopt another dog; they have lots of dogs who would love to be with someone like you. I'm so sorry for your loss. From the photo, it looks like you are cocker fans. I've got a cocker mix too. What a rough time. My thoughts are with you! My condolences, Phebe. I have had to deal with this myself with 3 cats and 1 horse and it is heart wrenching. It's true what Kathy said, they are an extra special part of our families. Phebe, I am so sorry to hear about Bailey. What a beautiful dog. I've had to put two Westies to sleep over the years and it was just as bad as losing a human member of my family. Thank you for sharing the adorable picture of the dogs watching AC and the clips. Thanks to everyone for the kind words and sharing experiences of the loss of your pets. It means a lot. @Jaanza, yes Bailey was our only dog at the time of her passing. We have always had two but when our beagle died a few years ago Bailey was already up in years and we didn't think she'd take too kindly to a little puppy nipping at her. We will get two more dogs in the near future but we need a while to get past our loss.